Everyone will devour their veggies with this recipe! 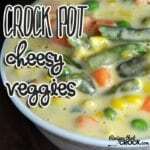 These Crock Pot Cheesy Veggies are super simple. Seriously, this would be a great starter recipe for someone who is trying out a making a side dish for the first time. I used Mr. Mini (my 4-quart Crock Pot). It was the perfect size for this recipe! There are quite a few servings in this lovely recipe, so if you are going to a potluck or having a holiday gathering, this is a must-make to keep everyone happy! The creamy cheese sauce is great with all those veggies! Make sure you stir frequently after the cheese starts to melt. You don't want the cheese on the edges to burn. Also, if you are taking this to a party or potluck, you will want to leave it on warm, but still give it a stir every once in a while just like you would a cheese dip.